2017 marks ten years since the release of Frank Turner’s debut solo album ‘Sleep Is For The Week’. A timely point then to look back and assess the work of one of our most prolific singer-songwriters as he himself has decided to do with his latest collection entitled ‘Songbook’. Over the course of twenty-nine songs, including ten re-worked versions, Frank has assembled a ‘very best of’ that really does emphasise his artistry and talent as both a songwriter and performer. Having released six albums and five EPs, played over two thousand gigs, sold over one million records and, perfectly aligned in the middle of it all a game changing Olympics performance, Frank has been quite the busy boy. Rather reassuringly, his work rate and work ethic sit perfectly with his ever-growing catalogue of notable songs. Each is real and dependable not flighty, fickle or flaky and the drive, determination and ethos of the man pours out passionately with each eloquent delivery. ‘Four Simple Words’, along with five others, is lifted from Turner’s 2013 album, ‘Tape Deck Heart’. Two of those tracks, ‘Polaroid Picture’ and ‘The Way I Tend To Be’ are present here both in their original format and in a newly reworked version. In the case of ‘Polaroid Picture’ Frank has chosen to take a more mellow approach, extending the original and enhancing it with layered vocals and jazzy inflections. ‘The Way I Tend To Be’ also gets an extended run, is stripped back to its core and laid bare with minimal accompaniment to let the lyrics cut through with a stark reality. ‘Broken Piano’ also gets revisited and is similarly affecting, the revolving guitar riff sitting below the vocal serving to emphasise the inherent despair. The main body of work on ‘Songbook’ is drawn from Frank’s last two, most successful, albums, ‘Tape Deck Heart’ and ‘Positive Songs For Negative People’, but there are still gems chosen from his first four releases. Fan favourite, ‘The Ballad Of Me And My Friends’ is included in its gloriously anthemic live format and also fittingly closes out the new collection as more of a piano lead ballad with Frank sounding more subdued, reserved, wistful and less attitudinal. ‘Photosynthesis’ goes more the other way from Folky jamboree to more immediate and confrontational. Somewhat surprisingly ‘The Road’ is the only track to make it onto ‘Songbook’ from Frank’s third album, ‘Poetry Of The Dead’. The song is yet another reminder of Frank’s mastery of story telling and his ability to build an engaging narrative thread throughout is lyrics. 2011’s ‘England Keep My Bones’ gets more of a presence with four tracks, two of which Frank played at the London 2012 Olympics. The fond reminiscences of ‘Wessex Boy’ and rallying mobilization of the infectious ‘I Still Believe’ remain as captivating as they were upon first hearing; both are a joyous outpouring and quite obviously heart felt and genuine compositions. ‘Positive Songs For Negative People’ contributes similarly inspiring moments. ‘Next Storm’ continues the coherent vein to Turner’s many stirring songs, flipping scenarios on their head to find hope amongst desperation. ‘Glorious You’ and ‘Get Better’ couldn’t do any more to bring home the album’s title message if they tried. Both songs act as a musical fillip to life. In an often unfashionable, sometimes derided, way Frank Turner manages to deliver hope, happiness and a way out, a way forward, a mantra for dealing with everything that life can throw at you. The only new song on his latest release, ‘There She Is’, sees Frank no less assured, open and… well… frank! Turner’s tale of all enveloping love and adoration sees him with his heart worn truly on his sleeve, exposing his inner most feelings through one of his more melancholic performances to date. 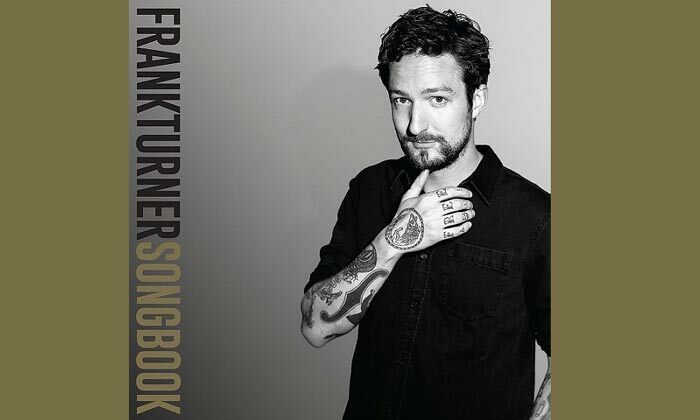 Through the nineteen songs that Frank Turner has chosen to include on ‘Songbook’ you can’t help but be blown away by the quality and character of each of them. The portfolio of work in this collection is uplifting, assertive and most definitely rousing; it’s an album that delivers musical endorphins in spades.